This week, Sesame Workshop launched a campaign, ‘See Amazing,’ to help educate their audience about autism. 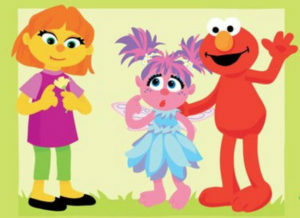 A new puppet, Julia, helps beloved characters Elmo and Abby Cadabby model how to interact positively with autistic children in a digital storybook. Parents and siblings of autistic children share their experiences and provide a glimpse into their lives. A new music video, The Amazing Song, stresses that people communicate differently and that’s OK. All children are amazing in their own way. The ‘See Amazing’ campaign is heartwarming and accepting. Full disclosure, I cried (in a good way) the first time I saw the video for The Amazing Song. Instead of asserting that alternative forms of communication and expression, like hand flapping, are wrong or pathological, they’re presented as simple difference. In videos that feature real people, autistic children communicate using augmentative and alternative communication (AAC) devices and apps and American Sign Language (ASL). Autistic children express joy and wonder in the world around them, flapping and playing with their peers. Sesame Workshop gives neurotypical children and adults an invaluable glimpse into how to have better relationships with autistic family and friends by modeling simple accommodations. Most importantly, the campaign is humanizing. The prevalent narratives about autistic children have described them as “empty shells” and lacking in human empathy. ‘See Amazing’ mainstreams what the Autistic community has known all along. Autistic children want and need what any other children want and need: Friendship and love. The campaign isn’t perfect. Person-first language is used repeatedly, despite a stated preference in the Autistic community for identity-first language. This means that most autistic people would rather be called “autistic people” and not “people with autism.” The reason is that many autistic people see autism as an inextricable part of who they are, rather than as something incidental or even pathological. Most parents want what’s best for their children. Given the stigma around autism, I can understand reluctance to acknowledge autism as an inextricable part of who their children are. Autism is a disability, and disability is not well received in our culture. That being said, preferences of autistic people themselves should take precedence over the preferences of people who are not autistic. It’s a matter of respect. Perfectly correct language isn’t the hill I want to die on, but it’s still an issue Sesame Workshop should take into consideration. More concerning was the lack of content for autistic children. The only content aimed explicitly at autistic children were daily routine cards that teach about things like how to try new foods or what to expect at a restaurant. The cards are fabulous. They use beloved Sesame Street characters like Big Bird and Cookie Monster, which helps to normalize the lessons in everyday interaction that autistic children don’t pick up automatically. Children already get to learn the alphabet along with their favorite Sesame Street characters. Why shouldn’t they also learn social skills? The cards are wonderful, but they really aren’t enough. The ‘See Amazing’ page itself is listed as a “resource for parents.” The form letter for campaign feedback only has ‘parent/caregiver’ and ‘provider’ as options. More than one video involves the parents of autistic children giving advice to other parents. The most regressive of the bunch involves parents talking about how to deal with the stress of raising an autistic child. It is profoundly uncomfortable to watch parents talk about how difficult and distressing it is to spend time with their children. I was an autistic child. While I acknowledge raising me was no picnic, the assumption that autistic people aren’t listening is misguided, at best. At worst, it points a finger at autistic children for making their parents’ lives unhappy. I know it isn’t meant maliciously, but that isn’t something any child should be told, especially by Sesame Street. Julia hasn’t appeared on any televised episodes of Sesame Street yet, but she absolutely should. Sesame Street has a stellar history of disability inclusion. It would be a shame if Sesame Street decided that autism is just too difficult (and by extension, different) to portray. It is frequently pointed out that approximately 1 in 68 people are autistic. That’s an enormous number of people to ignore. Sesame Street hasn’t shied away from difficult topics in the past. Worldwide, Sesame Workshop has addressed topics as complex as HIV/AIDS, the Palestinian-Israeli conflict and children whose parents are in prison. I hope Sesame Workshop continues that commitment by making Julia a regular character. Julia isn’t the first disabled resident of Sesame Street. That honor goes to Jason Kingsley. Jason has Down Syndrome. His mother, Emily Kingsley, was one of Sesame Street’s initial writers. When Jason was born, she transformed what Sesame Street could be. Jason appeared in over 50 episodes during the 1970’s and 80’s. The vast majority of Jason’s appearances were unrelated to his disability. He was just a kid on Sesame Street like anyone else. The real life Jason also co-wrote, with his mother, what can be considered the precursor to The Amazing Song: Count Me In. Count Me In positioned diversity similarly to how race or gender are positioned. After all these years, it’s still relevant. An updated version aired in 2002. Autistic representation on Sesame Street wouldn’t be the first time a different form of communication was shown to children across America. Linda the librarian, a deaf character, was a Sesame Street mainstay for decades. Sesame Street taught an entire generation of children some basic sign language. Linda was a part of the community. She had a job, recurring bits and a hinted romance with Bob. She retired in 2003, but the mark she left on the show is indelible. Julia isn’t the first disabled puppet. That honor goes to Aristotle, nicknamed “Ari.” Ari is blind. His first appearance was in 1982. His sketches are a little bumpier than Jason or Linda’s. Ari introduced thousands of children to Braille as a concept, but the approach the writers took is uncomfortable from a contemporary perspective. In this sketch, Big Bird loudly and repeatedly expresses skepticism that Ari (and other blind people) can read. While it may be a common misconception, Big Bird doesn’t model good behavior. If they were real people, Ari wouldn’t be out of line to give Big Bird the bird. Unsurprisingly, Ari did not last as long as his disabled human peers. He wasn’t authentic. Dr. Jeanette Betancourt, Senior Vice President of U.S. Social Impact at Sesame Workshop, says Sesame Street producers are waiting to hear back from the autism community before introducing Julia to the show on television. I can’t speak for an entire community, but Julia should absolutely be on TV. For decades, Sesame Street has taught Americans about disability. I appreciate Sesame Workshop’s commitment to getting it right, but for Julia to have a real impact, she needs to be seen by all children, not just by people who seek out specialized materials. Sesame Street needs to embrace all children, not just neurotypical ones. Sesame Street has a strong legacy of disability inclusion. 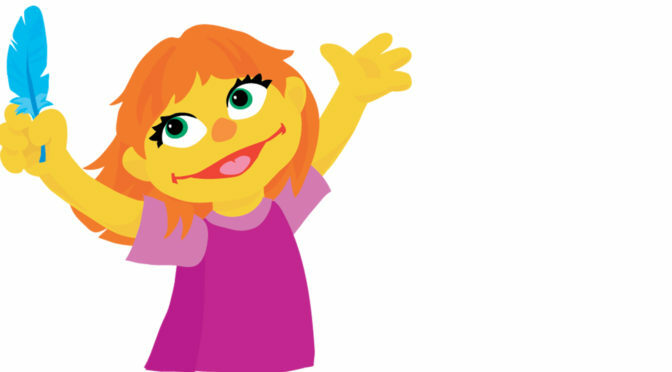 I hope they choose to continue that legacy by putting Julia on television and by remembering that autistic children are a part of Sesame Street’s audience. Faith, I think it is great that you have spoken about your excipeenre of growing up with two autistic brothers. There are a number of families located in different parts of the world, that struggle and have difficulty in understanding various problems within Autism, but I do believe that through sharing your excipeenres growing up with your 2 brothers, will help other families to have a better understanding of various areas of Autism, but also the ways in which it should be approached. I do hope that you are able to share you story at TED Global 2013, as the concept in normality of Autism Awareness, is something that needs to be given attention, as people in different parts of the world do struggle to understand the various problems within Autism and do require help and support. She had ‘learned’ unconsciously that ‘high rock walls=danger’. Don’t forget that you need four things to use your CPAP. As long as the drum rhythm was played, the circle was cast.